The Bari Esprit Bass Clarinet Mouthpiece provides a rich, vibrant tone and offers easy response f.. 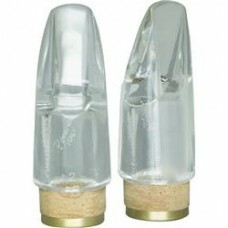 The world over, professionals as well as students use mouthpieces from this popular series. Every.. The Vandoren 5RV Eb Alto Clarinet mouthpiece is the hard rubber mouthpiece most recommended by band ..
Free blowing! The Vandoren B40 Eb Alto Clarinet mouthpieces are designed to use soft reeds without s..
Vandoren represents the highest quality with the B44, it is a durable all purpose mouthpiece. Design..
Yamaha's Standard series mouthpieces are designed to provide students and amateurs with an afford.. The balance of carefully designed and produced dimensions and facings gives J & D HITE mouthpiec.. Ideal for the advancing student, the Fobes Nova Alto clarinet mouthpiece employs many features on.. Exclusively hand worked and hand finished, the San Francisco models are a alto clarinetists dream wi..
Free blowing! The Vandoren B40 Bass Clarinet mouthpieces are designed to use soft reeds without sacr.. 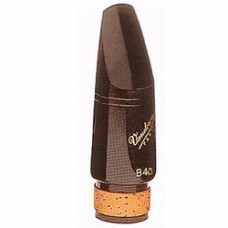 The world's most popular clarinet mouthpiece, the Vandoren B45 Bass Clarinet mouthpiece offer a wide..
Dance Band / Studio. The Vandoren B46 Bass Clarinet mouthpiece is ideal for the dance musician with .. The Vandoren B50 Bass Clarinet mouthpiece is ideal for the musician with classical background or the.. Immediate response. Regardless of the facing and chamber you chose, the Pomarico Crystal Bass cla.. Designed for the player who enjoys a wide open sound that is rich in overtones and projects extremel..
An excellent hard rubber mouthpiece for students and pros, the Basso Nova boasts the professional "C..
One of the best student Bass Clarinet Mouthpieces available. The design of the Debut allows for a st.. Exclusively hand worked and hand finished, the San Francisco models are a bass clarinetists dream.. The internal design of the HITE bass clarinet mouthpiece is unique in bringing a beautiful focus to ..
Encore mouthpieces receive the same detailed hand finishing and play testing as the professional lin..
Vandoren has long been accepted as the best mass produced mouthpiece in the world. Quality design as..
A wide range of playing options are presented by the Standard Series by Selmer. Every player can ..
One of the best student mouthpieces available. The design of the Debut allows for a stronger reed th.. Exclusively hand worked and hand finished, the San Francisco models are a contra alto clarinetists d.. Exclusively hand worked and hand finished, the San Francisco models are a contra bass clarinetists d..